This is the 1st edition to a series of deep-studies of modal play called ‘Scaling Up’. The 5-string format is nothing new but was reminded to me while watching a Richard Lloyd video, as he was playing F-Ionian this way. I decided to take the old as new and follow suit as it is quite true, and quite understated that the E string (1st or 6th) is or becomes redundant and repetitive in sound and function giving the 1st and 6th strings too much (perceived) power as a result. We will start in the usual way: beginning at the first fret of the 6th string and move upwards. The removal of the doubled E-string will make you concentrate more on the character and movement of the mode you are working on. We will start in F Major, ‘Scaling’ it modally though all seven degrees. We will begin ‘missing’ the High E and end ‘missing’ the Low E. When we reach the Harmonic-Minor Mode the tab will offer only the ‘lost 1st string method’ as by then you should know the territory quite well. This exercise is to be played both up and down the neck in equal measure with the realization that the intervallic relationship of 1’s (Ionian) 1st string and 2’s (Dorian) 6th string is constant. Carl Snow is an old, jaded & slightly bitter old man who cannot be held accountable for anything, much less his opinionatedly opinionated opinions or those of his imaginary friends. We sincerely apologize if this Carl Snow and/or its behavior have infected you or others with its ugly brain and its juices. We will begin in F-Major, ‘Scaling’ it, modally, though all seven degrees, beginning with (1)Ionian(Major) and ending in (7)Locrian(Diminished). We will begin ‘missing’ the High E and end ‘missing’ the Low E. When we reach the Harmonic-Minor Mode the tab will offer only the ‘lost 1st string method’ as by then you should know the territory quite well. We start at the first fret on the 6th string on F and play F-Ionian (More on the “missing string” later) and as we return to the 6th string after completing the mode we find ourselves in the second mode of the major Scale, (2) Dorian; from there we simply repeat this process though all seven Major Scale Modes (beginning in F and using “3-Notes per String” scales here, rather than ‘compact’/’beginner’ scales). 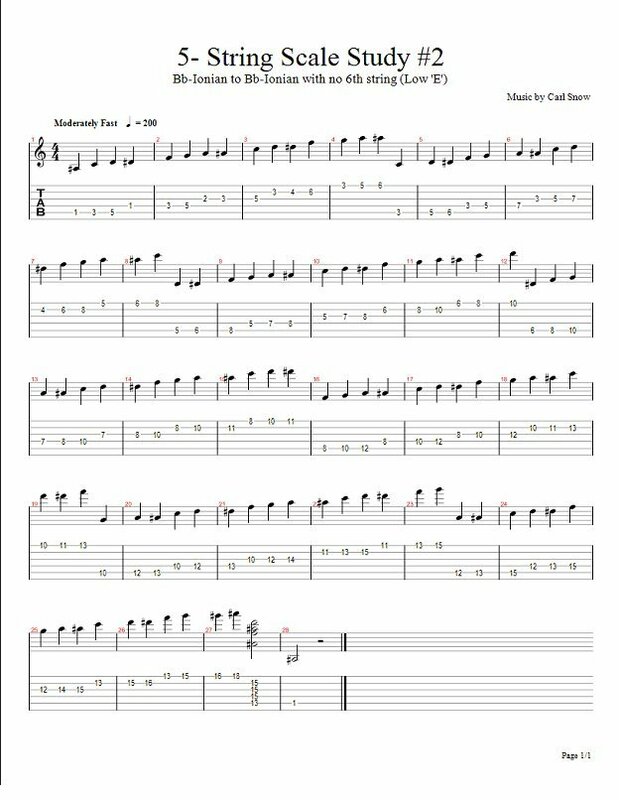 If you were to “play-out” the entire 6-strings, in any mode in these exercises, that first-string will mirror the notes that begin the next mode above it on the sixth-string (lowest) *exactly. When using the ‘no low E’ (Bb) method the same thing will happen. Usually, when ‘running a mode’ we revisit 3 notes from the 1st scale, giving the impression (often subconscious) that these tones have an added weight to them, this is simply not true; in the same way that a double-octave(two octaves higher or lower) is achieved when playing both E-strings on the same fret, this double-octave, sneaks into modal structures such as F-Major and while playing the “entire” 6-strings, ascending and descending up and down the fretboard is highly recommended, I suggest adding this tool to your modal studies as the heart of the mode is more clearly defined. Many books-etc announce with great ‘authority’ that “Phrygian sounds very Spanish” and such. This may not feel true to YOU, the guitarist playing said mode, exploring/practicing in the fashion detailed above may open your ears to new interpretations, usages, while urging personalization, and giving your fingers a nice workout in the process. 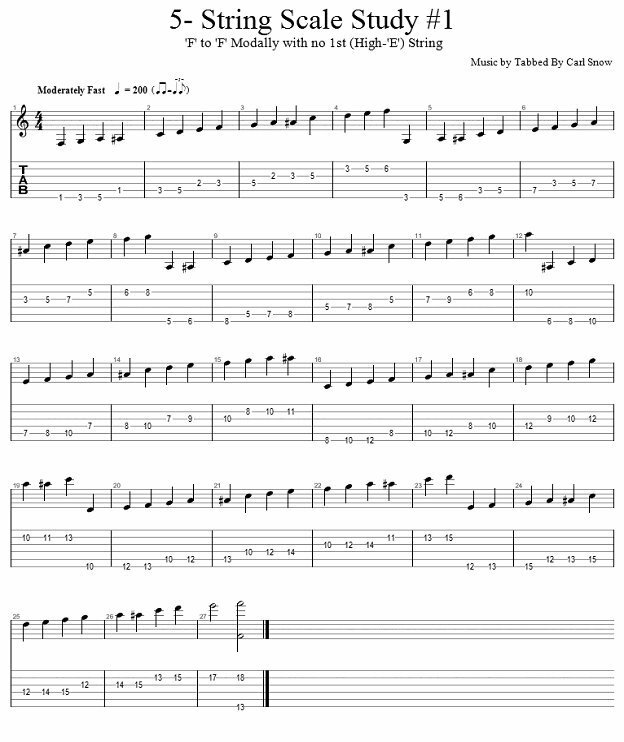 This may not be “learned at once”, but after study and practice should be played as a non-ending “run” (a metronome helps greatly) with no gaps between modes. Carl, you can edit your own lessons, it'll let you use the text coding too. Other than that, great lesson for the guitarist to become familiar with the scale up and down the whole guitar (as opposed to learning a box). Quick question, what app did you use to make the transcription?